I'm so excited as earlier on this week I reached the 100 follower milestone on my blog. I thought that would be a great time for my first giveaway, and i've been putting together a little bundle of goodies that you can win, including Molton Brown hand cream, Ciate and Rimmel nail polish, Rituals body cream, an MUA Undressed palette and much more! You can enter via the Rafflecopter widget below and i'll be drawing the winner in a few weeks time. This is a UK only giveaway this time, but I hope to do an international one in the future. N.B This giveaway is now closed, but keep your eyes peeled for future ones. Wow I don't think I have a favourite product! But I do love Body Shop products at the minute! Favourite product has to be Soap & Glory Sugar Crush Body Butter! Very difficult to pick just one! 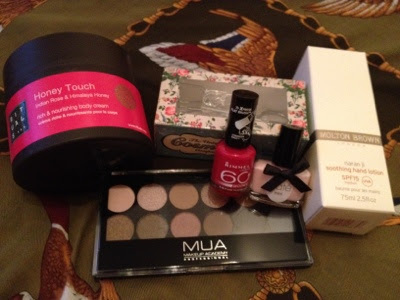 New follower here and a shame we didnt get to meet at the bbloggers christmas! My Favourite product of 2012 is Percy & Reed Dry shampoo! My favorite might be China Glaze nail polish :) Or possibly the new holographic colors! L'occitaine (angelica I think it's called) moisturizer. I am loving Maybelline's new BB Cream line! 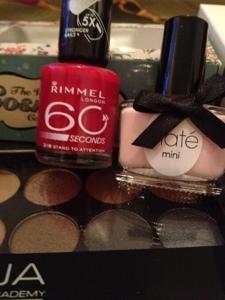 My fav product this year must be the sache vit nail polish i got in my glossy box - amazing colour and great quality too! The lush bubblegum lipscrub, yum! Cetaphil's gentle skin cleanser is my fave product of 2012, it keeps my skin clear, love! soap and glory bath bombs are my massive discovery, and MUA lipsticks!! After trying Rituals in a Glossybox I am a little obsessed, they smell so good! Naked 2 palette from Urban Decay.